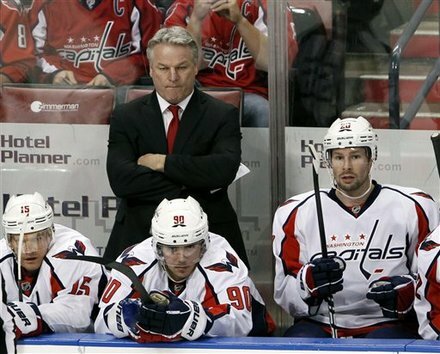 Dale Hunter has stepped down from head coaching duties for the Washington Capitals. A move confirmed by general manager George McPhee. Not even 48 hours after the Caps' game seven loss to the New York Rangers, Hunter decides to leave a team that reinvented itself for him and his way of winning. Failing to get to the third round of the Stanley Cups playoffs now for a fifth straight year, the Capitals are now charged with the duty of finding a suitable bench boss to get them into the Eastern Conference Finals. Hunter told reporters "it's time to go back to my family and the family business." He is set to return to his London Knights, an OHL team that Hunter and his family are heavily invested in. McPhee, as did many pundits and fans, was not surprised by Hunter's sudden change in employment. "We loved everything about Dale," McPhee said of Hunter's short stint as coach. "We were delighted he could come in and spend six months with us. He really taught the club the 'how' of winning." Hunter failed to get the hapless Caps to the Conference finals by losing game seven at Madison Square Garden. His style of defense first was bought in, for the most part, by the entire team. Show sacrifice and dedication to the team is what he preached, whether it was a big goal, a blocked shot or a sparkling save. He was able to deal with some massive egos in a locker room that seemed to lose its way. When asked if there was any part of the job he didn't like, Hunter looked at the reporters and smiled. "I love you guys." Now McPhee will not only tie up loose contracts, fill voids and add to his team, but now he has to find a head coach to take them back to the playoffs and push the team to a championship. Jay Beagle had a broken foot, the injury that kept him out of the final two games of the Rangers' series. Beagle will have surgery to repair the foot. When GMGM was asked which foot, the left or right? His answer "One of those two." McPhee doesn't expect Caps' prospect Evgeny Kuznetsov to join the team next year. He resigned with his KHL team amid worries of a failed CBA and his want to play in Sochi 2012. Nick Backstrom, Alex Ovechkin and Alex Semin are leaving today to join their respective countries in the World Championships. Michal Neuvirth suffered a hip flexor injury at the end of the regular season.